Felix Gilman was born in London and grew up in the south London suburbs. He attended school in Sevenoaks, Kent, and read history at Oxford for three years, then got a master’s degree in “Elizabethan stuff,” graduating in 1996. After working briefly for a small London publisher, he moved to the U.S. to live with his wife, Sarah. They resided in Washington D.C. for a couple of years starting in 2000, where he worked as a writer for a telecommunications business publication. He then attended Harvard Law School. He has worked for the federal courts in New York and in private practice. Felix Gilman is the author of several well-received novels: Thunderer, Gears of the City, and The Half-Made World (which made my top ten list last year). His newest, The Rise of Ransom City, is a wonderfully unconventional follow-up to The Half-Made World (here's my review). He recently took some time to answer a few questions, including why he opted against writing a more typical sequel and what projects he is currently working on. You can find out more by visiting Felix Gilman's website. But really, what you should do is just go read his books. And if you'd like a chance to win a copy of The Rise of Ransom City, just leave a comment below. 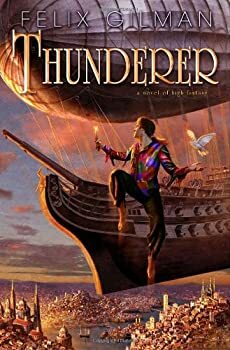 Thunderer — (2007-2008) Publisher: In this breathtaking debut novel by Felix Gilman, one man embarks on a thrilling and treacherous quest for his people’s lost god — in an elaborate Dickensian city that is either blessed… or haunted. Arjun arrives in Ararat just as a magnificent winged creature swoops and sails over the city. For it is the day of the return of that long-awaited, unpredictable mystical creature: the great Bird. But does it come for good or ill? And in the service of what god? Whatever its purpose, for one inhabitant the Bird sparks a long-dormant idea: to map the mapless city and liberate its masses with the power of knowledge. As the creature soars across the land, shifting topography, changing the course of the river, and redrawing the territories of the city’s avian life, crowds cheer and guns salute in a mix of science and worship. Then comes the time for the Bird’s power to be trapped — within the hull of a floating warship called Thunderer, an astounding and unprecedented weapon. The ship is now a living temple to the Bird, a gift to be used, allegedly, in the interests of all of Ararat. Hurtled into this convulsing world is Arjun, an innocent who will unwittingly unleash a dark power beyond his imagining — and become entangled in a dangerous underground movement that will forever transform Ararat. As havoc overtakes the streets, Arjun dares to test the city’s moving boundaries. In this city of gods, he has come to search among them, not to hide. A tour de force of the imagination, and a brilliant tale of rebellion, Thunderer heralds the arrival of a truly gifted fantasy writer who has created a tale as rich, wondrous, and captivating as the world in which it is set. It seems lately that a lot of books have come out where setting plays as large a role as character. I’m thinking of Jeff VanderMeer’s Ambergris, China Miéville’s New Crobuzon, Gregory Frost’s Shadowbridge, and Jay Lake’s Mainspring. 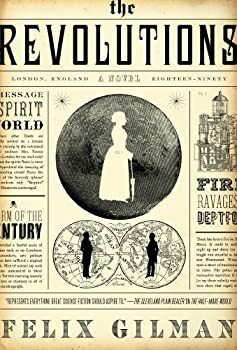 Books that haven’t simply created a new world, but whose world itself is an integral part of the story, rather than just the physical part the story moves across. Despite a somewhat slow and haphazard beginning, I thought Felix Gilman’s Thunderer was one of the best debuts I read in 2007 and couldn’t wait to get my hands on the sequel. 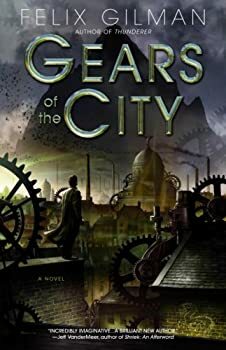 Alas, Gears of the City was a bit disappointing in comparison, but still a very good book. The Half-Made World — (2010-2011) Publisher: A fantastical reimagining of the American West which draws its influence from steampunk, the American western tradition, and magical realism. he world is only half made. What exists has been carved out amidst a war between two rival factions: the Line, paving the world with industry and claiming its residents as slaves; and the Gun, a cult of terror and violence that cripples the population with fear. The only hope at stopping them has seemingly disappeared — the Red Republic that once battled the Gun and the Line, and almost won. Now they’re just a myth, a bedtime story parents tell their children, of hope. To the west lies a vast, uncharted world, inhabited only by the legends of the immortal and powerful Hill People, who live at one with the earth and its elements. Liv Alverhyusen, a doctor of the new science of psychology, travels to the edge of the made world to a spiritually protected mental institution in order to study the minds of those broken by the Gun and the Line. In its rooms lies an old general of the Red Republic, a man whose shattered mind just may hold the secret to stopping the Gun and the Line. And either side will do anything to understand how. 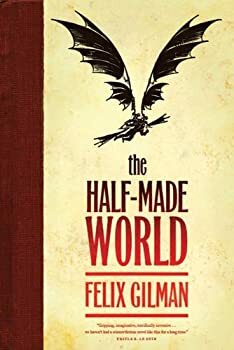 The Half-Made World, by Felix Gilman, is a strikingly original book that, though it has its flaws, is a fascinating opening to a new world and characters. I look forward to rejoining when the sequel (and the title “The Half-Made World “pretty much mandates a sequel) arrives. The Rise of Ransom City: Climb aboard! If Horatio Alger, rather than Mark Twain, wrote the sequel to Huck Finn (though keeping Twain’s wry humor) after he lights out for the territories, and if Huck were possessed by the spirit of Nikola Tesla, and if the Wild West were the Wild West except that the trains and guns were all hosts for demons battling for supremacy while haunting both sides is the possibility of a sort of doomsday device, well, then you just might be close to approximating Felix Gilman’s The Rise of Ransom City, a kinda-sorta sequel to his The Half-Made World, which I had on my top ten list the year it came out. The Rise of Ransom City might not be quite that good, but it doesn’t fall far short. 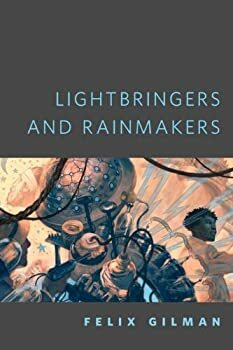 Lightbringers and Rainmakers is a good novelette with some neat hooks tying it to the larger tale of The Half-Made World. We follow, as his business cards state, "Professor" Harry Ransom, Lightbringer &c, &c (who made a small walk-on cameo in The Half-Made World), one part charlatan and two parts idealistic scientist, as he is pulled into the midst of the inescapable war between the Line and the Gun. Not only has his “apparatus” once again been destroyed leaving him on the edge of poverty, but now he must deal with the machinations of a rival "scientist" (the rainmaker of the title) and the intrusion of the Line into the small western town he has found himself in as they cast their net in search of some characters we may be more familiar with from Felix Gilman's larger tale. It was a hodge-podge of Masonry, Greek myth, Egyptian fantasy, debased Christianity, third-hand Hinduism, and modern and ancient astronomy, promiscuously and nonsensically mixed . . . The Book was riddled throughout with paradox and absurdity and contradiction . . . But after a week or two of study, Arthur began to enjoy it.